Earlier in the month we shared Concepts’ Fall 2018 lookbook which included a small preview of the upcoming Nike Kyrie 4 “Green Lobster.” Now Concepts took to its Instagram to announce a surprise raffle for the Nike SB inspired colorway. The iteration follows the Kyrie 4 “Yellow Lobster” edition that was seen on Kyrie Irving when he faced off with LeBron James last season. The design stays true to its original construction with various shades of green throughout the upper and sole unit. Its laces are dipped in volt while its inner lining shares a picnic-table inspired pattern. The look is completed by a blue rubber band around the toebox to continue the lobster influence. 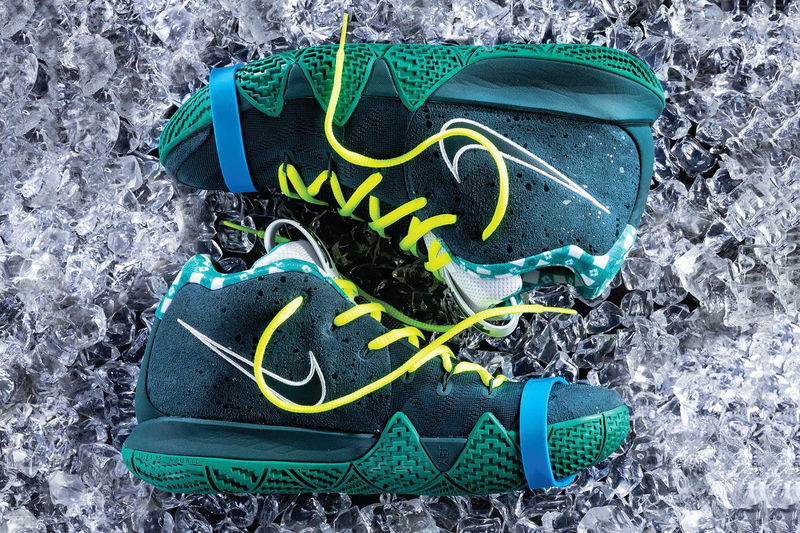 The Concepts x Nike Kyrie 4 “Green Lobster” raffle is being held today at Corporal Burns Park at its basketball courts from 10 a.m. to 1 p.m. Take a look at additional information below and let us know if you plan on trying your luck. Signature sneaker silhouettes and all. The rapper will be part of the game this year.